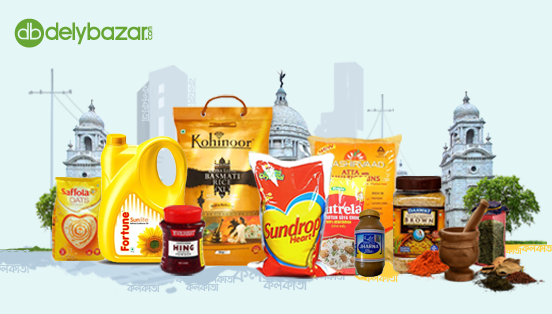 ABOUT : With Brown & Polson vanilla-flavoured custard powder it is easy to prepare custard. This popular Indian dessert which is quite close to English pudding in taste is a free-flowing liquid which can be refrigerated and served chilled. This custard powder can also act as a base for several custard-based puddings that are common in Europe. Used as a thickener, it provides a smooth creamy texture to your puddings. 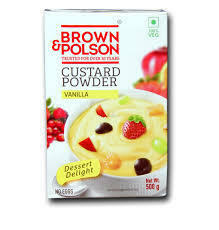 COMPOSITION : Along with salt, starch and maize, Brown & Polson vanilla-flavoured custard powder also includes natural and artificial flavourings, ethyl vanillin and some permissible yellow food colour. Ingredients noted in this custard powder are FD&C Yellow 5, nature identical & artificial flavoring, FD&C Yellow 6, and FD&C Red 40. HOW TO USE : You need to mix the custard powder with ¼ cup of milk and stir it so that there are no lumps; instead you have smooth creamy base. The custard mixture along with rest of the milk and sugar should be put on a small saucepan and put on low-medium heat. You need to stir the mixture vigorously until the custard boils and thickens. Simmer it and stir it for another 1 minute; once it is cold you can set it in the refrigerator. Serve it with fresh fruits and ice-cream.